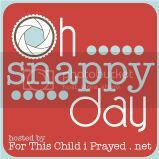 For This Child I Prayed: It's your lucky...err...Snappy Day! I visited Random.org and not counting my own picture the winner number is #3! Congratulations to Lauren @ TheBlacks09.blogspot.com! Email me at forthischildiprayed.net@gmail.com to claim your Target gift card! Thanks so much to everyone who entered! I absolutely loved looking at your presh fall photos.